The system includes the sensors, software and alert functions you need to receive real-time frost alerts, monitor and record wind conditions prior to spraying and calculate evapotranspiration (ET), growing degree days as well as chill hour accumulation based on local conditions in your field. Adding special-purpose stations will expand your system's capabilities even further. Wireless sensor suite with integrated sensors for temperature/humidity, rain, and solar radiation. Includes a daytime fan-aspirated radiation shield for greater accuracy. 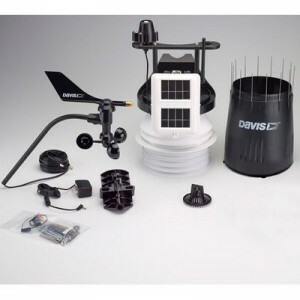 Detachable anemometer provides wind speed and wind direction and can be sited above the crop canopy. Real-time alerts for frost, high winds or other conditions you specify. Remote data communicated via cellular connection using Vantage Connect. Software to help you track ET, growing degree days and chill hour accumulation. Weather on your smartphone with our free app for iPhone or Android.